Nicola talks us through everything she did mentally, emotionally, and skill / learning-wise to get prepared and ultimately land her first opportunity back after her 12-year break. She talks through how she figured out which skills she needed to learn, how she started getting internships as a “non-traditional intern” (i.e. not a young college student), how she prepared her portfolio, and got up to speed on technical skills like Adobe Illustrator and tech packs, and also shares the technique she used on her resume so that the first thing brands saw wasn’t a big 12-year gap. Nicola also talks us through how she bombed her first interview and exactly why it went so terribly, and what she did to better prepare for future interviews. 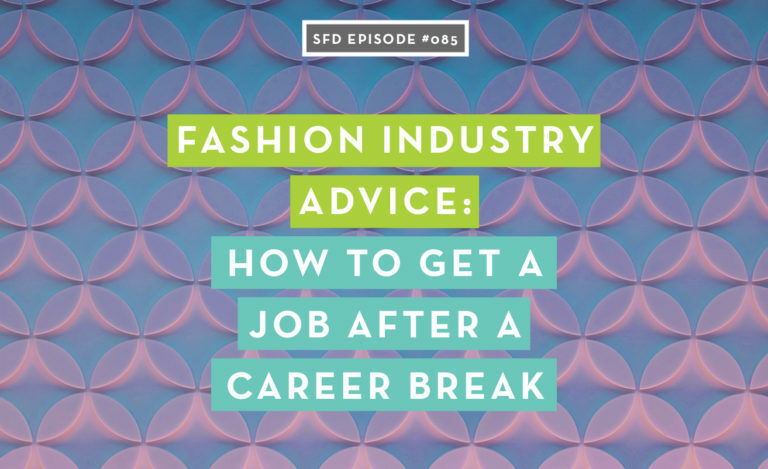 Whether you’re struggling with your job search now, or you too have taken some time off and are breaking back in, there’s so much great inspiration and insight in our interview today. Nicola Osborne is a technical designer for a children’s apparel company in San Francisco. She’s passionate about apparel and has worked for leading British clothing brands such as TopShop, New Look, and Next, where she helped bring the product to market for the right cost at the right time. Her wider experience working for vendors has given her hands-on knowledge of the garment development process, manufacturing systems, and order fulfillment. But she’s been in the industry for a LONG time, and has deep roots in it. Nicola got started in the fashion industry as a fashion model while she was still in school. After she retired from being a model when she was 20, she knew she still wanted to work in the industry in a way that was more intellectually stimulating. She went to a two-year fashion design course in her hometown, fell in love with garment construction and pattern-making, and became fascinated with the technical / skilled side of clothing. She went to a four-year course in fashion and textiles management, and learned all about fabrics, manufacturing, and the business side of the industry. She had never even heard of the garment technology / technical design job position when she first got started in school! But once she dipped her toes in the water, she knew she wanted more. Nicola got one of her first jobs as a junior garment technologist at New Look, a fast-fashion clothing brand. She got great insight into the whole process of getting the clothes made and into the customers’ hands, which is something a lot of people don’t get to do when working with factories in China. After New Look, she got a job at Next in the childrenswear department. While she wasn’t originally interested in getting into childrenswear, she ended up liking it and honing her niche–it became a specialty for her. There’s so much to keep in mind when designing childrenswear, and so many different body shapes to keep in mind when grading and sizing for infants up to 12 year-olds. Then there’s safety considerations–and once you’re in the niche, you’re quite specialized. The challenge of how to move forward was daunting for her. Things had advanced so much, and her role as a Garment Technologist didn’t really exist in the United States (where she and her family were living at the time), but she found that the Technical Designer position was something she could jump into with a little bit of work. But that bit of work was…Adobe Illustrator. Every single job asked for it, and she’d never used it before. So she researched and researched and signed up for courses, and whittled away at her skills. Nicola worked hard to learn the technical side of the industry, and then made proof that she knew how to do it. Twelve years is a long time to be out of the industry, and she wanted to show people that she knew what she was doing. She took on self-directed sample projects to show interviewers that she knew how to do the work, which requires so much determination! After a lot of hard work, she started to put herself out there. 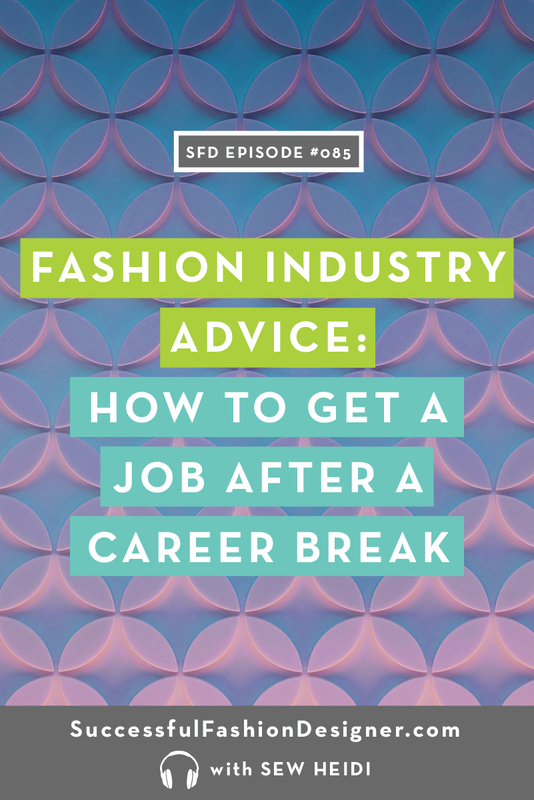 She took on a couple of internships that ignited that passionate spark for the fashion industry, and really kept her going through the hours of going through Illustrator tutorials. Through it all, Nicola kept going because she didn’t want to NOT do it just because she was scared. She told herself that if she didn’t carry on, it would be stupid. If it didn’t work out, it would be better to say that she tried rather than not. She immersed herself in learning about the industry again–learning the language of the industry and reading what was going on, so she could talk about it in interviews. Working on her resume was another way Nicola leveled up her professional presentation. She picked up tips and tricks online and got an interview every single time she submitted a resume. Interviewers constantly said that they were impressed with the way she clearly outlined what she did while she wasn’t working. Her “Career Development” section of her resume was a real game-changer, and her “Courses” section, too. She was able to show that she had been working hard the last few years! Yes, she bombed an interview. But the buzz she felt afterward was a good one…she was back into it! The interviews after that were better, and she pushed her boundaries and learned a lot. Now Nicola has a job that she loves (totally cried when she got it–and we don’t blame her! ), and they chose her because of all of the self-directed career development that she did. She proved that she’s willing to work, and wants to better herself constantly.